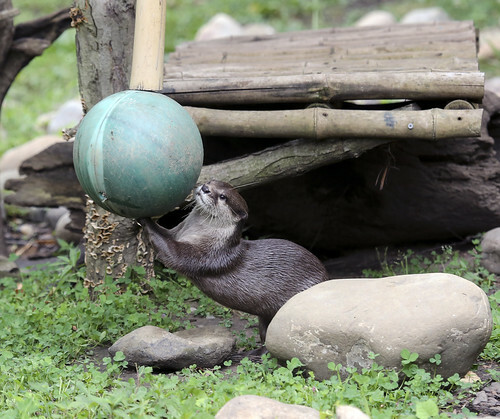 Our Open Thread this weekendfortnight is hosted by an otter with a ball. This woman’s retort to racist comments was so strong and spot on. I’m whiter than white but my husband is Aboriginal (as is my daughter) so I have a fair bit to do with community (Aboriginal people). Even after 10 years of this involvement it still makes me sad that when I encounter Aboriginal people I don’t know in public (on the street, at the health service, on PT) that when I look at them they nearly always look down with an expression and demeanour that says they are expecting me to have a go at them. Obviously I’m not about to have a go at them but a lot of people would and that is appalling. And it is sad that Aboriginal people have come to expect that as the default reaction to their presence in a public place. Usually a smile or a g’day and how you doing? (as I tend to say to most people I come into contact with – I’m one of those people who always talks to people whether I know them or not) is met with a ‘Not bad sis’ or ‘Not bad aunt’ and a grin. Sometimes just a nod. Sometimes no reaction or response at all. And that’s ok. They don’t owe me a response. I just want them to know not all non Indigenous people are thoughtless inconsiderate idiots who are too scared (and too racist) to sit near or talk to an Aboriginal person. It’s so sad to see that there are such pervasive narratives of racism in Australia still, where we are supposedly such a multicultural country. Nice things that are happening today: I have an apple cake in the oven and the whole flat smells delicious. It’s for a seminar at uni this afternoon where I may or may not be receiving a huge travel scholarship. Celebratory cake, I hope! Jo, how did you go? Celebratory? In the past few weeks I’ve seen more and more reports of the #opencarry gun-fondling brigade doing their you-can’t-stop-me stunts in the States, and I’m fearful of where it’s going to lead. They seem to want a confrontation, and it seems inevitable that if they keep doing this, then some of them will get exactly what they want. tigtog, that was a terrific article, thanks for linking! Jo, any news about the scholarship? All quiet here except for Maddie’s Great Adventure this morning – the little ratbag managed to sneak out the door without me seeing her. I didn’t know she’d gone until an hour or so later when there was an almighty rattling at the back door. I went to have a look and there was Miss Frighted wanting to run inside, away from the threatening sound of the rubbish truck on its rounds! Poor baby’s had to spend the rest of the day asleep to recover from it all. In other news, I’ve finished my reconstructed reconstructed skirt/jacket. I bought it on Etsy in this form – gorgeous, but it proved too densely knitted (the top is about 12ply) and close-fitting for comfort. I get hot easily and need to be able to layer. So after chopping it in half, binding off a waistline and using some spare yarn to make a jacket, I now have this, which is much more practical! Kittehserf I like the idea of repurposing a repurposed garment and I love the idea of generational buttons. Also yay for big pockets! You are very clever. Glad to hear Maddie is safe and well after nothing worse than being frightened by a noisy garbage truck. Perhaps now she will believe you that it is nicer inside. I can’t take credit for the pockets – everything on the skirt part is as I bought it. I love repurposed garments too, they look so good. Jo!!!! YAYYYYYYYYYYYY!!!!!!!!!!!!!!!! Well done you!!!!!!!!! Aww, thanks you guys! You’re all so nice. Re: the DW leaks – I feel like I have largely lost my fannishness for the show, but still am staying away from the internets for now. Why would you want to spoil all the fun of the anticipation and surprise? Hell yeah, Jo, go you! With the emmy contenders just having been announced, I’m not the kind of person who uses words like “travesty” or “robbed” when someone doesn’t get nominated. But when it comes to Tatiana Maslany, I make an exception. Because her not getting nominated really *is* a bloody travesty. I have started watching Orange Is The New Black. Although the protagonist is a Nice White Lady, so far it seems to be avoiding the White Saviour trope, which is a relief. I find I am enjoying the other storylines more. Aphie, I think I need to invest in a boxed set of the 1st season of OITNB – I keep hearing such interesting things about it. Did you see this wonderful post by Brocklesnitch where she fisks some dudebro who was upset that OITNB doesn’t focus enough on teh menz? Oh dear, yet another #sciencefail plothole. I’ve decided to investigate getting a white streak in my hair at the front on one side – my hair is slowly silvering, but I’d like to do something that makes a statement while it works its way to the fall of silver I want to eventually have. So, advice on home bleaching and where to find a nice pearlescent silver dye to go on top of the bleached lock? Did I fail to set a new Otterday? Shame on me! In my defence, school holidays have me all ends up, what with housefuls of 11-13 year old boys (ARGH) and ferrying to robot club and whatnot. Can we just keep on going here instead? tigtog: No home-made advice, I’m afraid: I would definitely go to a hairdresser for anything involving bleaching, because of all the going-wrong potential. In happy, if domestic, news, a shopping trip this morning went incredibly smoothly. It was one of those trips with about seven or eight different shops involved, sourcing a series of more difficult-to-find items, and so on, which would usually end up in various small but additive frustrations, and including a haircut and a custom jewellery order as well as clothes and other things, and everything just went … smoothly. And quickly. Everything was in stock, some was even unexpectedly discounted, and it’s all good. I was about to suggest the library for OitNB, if you’re into binge-watching, but at my library it’s already up to 21 reserves for 3 sets, so maybe not. PS I have all the commas, so nunayouse can have any, ner. Yay for shopping trips going smoothly! FatHeffalump just posted this link and I think it is fantastic. I also like the FAQ page. I did, tig, it was awesome. And I agree that there’s way too much Larry. I have SO. Much. rage. for people on a forum for Early Childhood teachers who are promoting shaming a male-identified child for dressing up in skirts and dresses “because it’s the parent’s choice and we have to respect their (the parents’) beliefs”. So ragey I broke my rule about not commenting on posts. That poor child. I hope that child has someone at his daycare centre who sticks up for him. Good on you Aphie. I’m glad to remember how the teachers at my kids’ preschool allowed a young boy who liked to dress up as princesses to do that even though his dad hated the idea (his mum was more understanding). They just made sure (after a few confrontations) that they persuaded him to play something other than dressups about half an hour before his dad was due to pick him up. I had a friend who did that with another friend’s kids. She painted the boys nails, let them try out her high heels, and generally enjoy themselves and be kids then their mum would call about ten minutes before pick up time, everyone would get changed and remove any nail polish and be playing chase or something in the backyard when the parents arrived to collect them. All because their Dad was convinced they would end up gay if they played dress-ups. I kid you not. My post about silver hair has been eaten by the InterNet. How sad. As it contained no useful advice, perhaps just as well. Aphie: they are what?? It’s so basic that kinder is a place for children to explore their ideas and understandings! I get that the child’s role play is discomforting to their nice-middle-class-lady mores and they don’t want to have a fight with the parents, but the child’s needs and interests are paramount! What are they doing, not letting the child wear the fairy dresses? WTF? “respecting the parents” – what a disgusting cop-out. I bet they don’t say that when the parents choose to send a snack box full of junk food: you can bet your bottom dollar ‘healthy snack box’ posters are all over the joint. It’s terribly difficult to come to terms with the idea that your child is different: people want their children to be happy and being the same as everyone else (only smarter and richer) is safe. And loving unconditionally is hard. When children show difference, people are afraid for their child, and angry. The kinder teacher should be modelling acceptance and support for the child. Also, exploring gender roles is totally normal. I know several little boys and an older one (pre-teen) who are all about the frills, dresses, sequins, feather boas, nail polish, hair clips etc and I LOVE that their fathers (and mothers) are all cool with however their boys want to dress. I get that it shouldn’t be a big deal that these dads are accepting but when you hear about things like Alphie shared, it does make it a big deal when you come across parents who are cool about it all and that they really couldn’t care less as long as their son is happy and having fun. I thought the pre-teen boy would get a fair bit of stick at school about his wardrobe choices but he doesn’t and that is great. Yeah, BK, I was super worried about my Tiny Tyrant starting school this year – his favourite colour is pink and he loves My Little Pony as much as explosions and spaceships. Thankfully, he’s been fine – found a couple of lovely close friends and a wider circle of children of both genders who seem to really like him. Eilish – it is! Especially at the preschool age! It’s our job as educators to know and support that, IMO. We’re meant to advocate for the children in our care, not support parental behaviours that could amount to emotional and psychological abuse. You don’t have to even read a bunch of feminist theory to know this – it’s in a huge amount of reputable, mainstream literature about children’s development. It’s also v telling that no parents ever seem to have trouble with their daughter wearing pants or playing with toy cars – whenever this sort of issue comes up it seems to be about boys and fairy dresses. Sometimes I think the Oh-noes-dressing-up-is-gay panic merchants really need a crash course in the history of fashion, even if just Western fashion. Elizabethan dudes, anyone? Macaronis? tigtog, seconding lauredhel about hair – get it done at a salon. I have been asked to co-author a chapter for a book on happiness, on happy endings in narrative, particularly in regard to what adults choose to offer children in their stories. Bet a lot of you have opinions on this topic. Whattaya got for me? Firstly, congrats to you on the gig. Secondly, wowitty that’s a huge area to condense down into a chapter. I’ve been intrigued lately to see Disney start offering happy endings where “true love” triumphs as exemplified by long-term loving relationships between family/friends/guardians explicitly contrasted against heterosexual romantic partnerings that are undermined/destroyed by lies or betrayals. Mr12 spent the vast majority of his pre-school years wearing a blue dress that I’m pretty sure had been a flower girl outfit prior to being donated to the pre-school dressups collection. He’d make a beeline for it every morning and as it was way too big for any of the other kids he didn’t have much competition for it 🙂 This was particularly good because by 4 he’d grown out of his older sister’s clothes and couldn’t steal them any more without popping the seams. This is good advice even for romantic pairings (not that I don’t agree with a wider spectrum of relationships than romantic ones). There is actually an interesting Simpsons episode where Homer is reading a Harrypotteresque book to Lisa and reads on ahead and discovers that the Dumbledore figure dies. So he changes the ending so she won’t be upset. Lisa of course reads the ending for herself but decides that she prefers Homer’s. Although Old Yeller is somewhat of a scar for many of my generation and previous ones I think it was a good introduction to everyone doesn’t always live happily ever after. Are we happier knowing that happiness could be fleeting?